Joint List MKs attempt to hold demonstration in Knesset against Vice President Pence's visit, are removed from plenum. Knesset Members from the predominantly Arab Joint List party were removed from the Knesset plenum Monday afternoon, shortly before Vice President Mike Pence addressed the Israeli legislature. The Joint List MKs, who had earlier vowed to boycott Pence’s address, attempted to hold a protest in the Knesset Monday against the Trump administration, with some holding placards reading “Jerusalem is the capital of Palestine”. 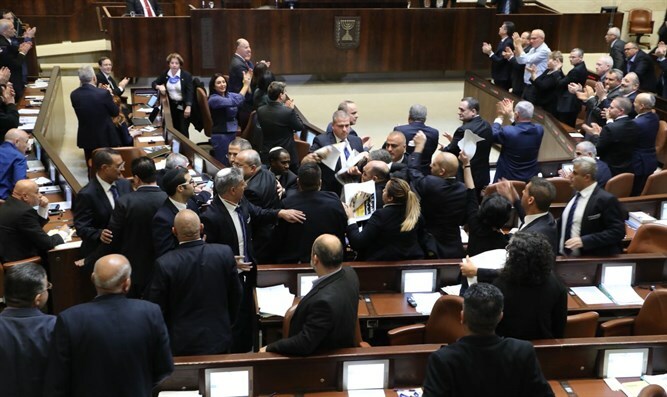 The protest, which was held in violation of Knesset regulations, was quickly broken up by Knesset officials, who escorted the MKs involved out of the chamber. Following the disruption, Vice President Pence addressed the Knesset – the first speech by a senior US official at the Israeli legislature in a decade. During his speech, Pence vowed that the US embassy would be moved to Jerusalem before the end of 2019, and reaffirmed the importance of the US-Israel alliance.